Following our weekend away I spent most of Monday and Tuesday washing clothes. With my neck being mostly recovered I went back to netball training and coped okay despite being bitten several times (by insects, not opposing players I'd like to add). We had a birthday party today and then spent the afternoon at my parents, who are away, but I borrowed their garden and paddling pool for a few hours. So it has been a quiet week on the crafting front. I find the hot weather makes me not want to do anything at all! I have also been applying for a job which I will share more about if I am successful. The garden fencing is now complete and on Monday my father in law is coming over to help with digging up weeds and possibly laying down turf which will be potentially life changing. Letting the children play in the garden while I craft is perhaps too good to be true but I hope that there will at least be a little less mess in the house as they will all be in the garden planting and other delightful things that keep them contained in there for several hours every day. I also want to have a barbeque; we own a barbeque but it hasn't been used in 2 years and I love having people over and cooking so this is high on my prority list. I even boutght the Barbeque cleaner set and offered to do it (WHAT?!! I know but it's too late to retract now :'( Yikes) While my other half and his Pappa do the garden, a lovely friend is going to take my kiddies, ALL DAY so I am hoping to get some decorating done and clearing done. 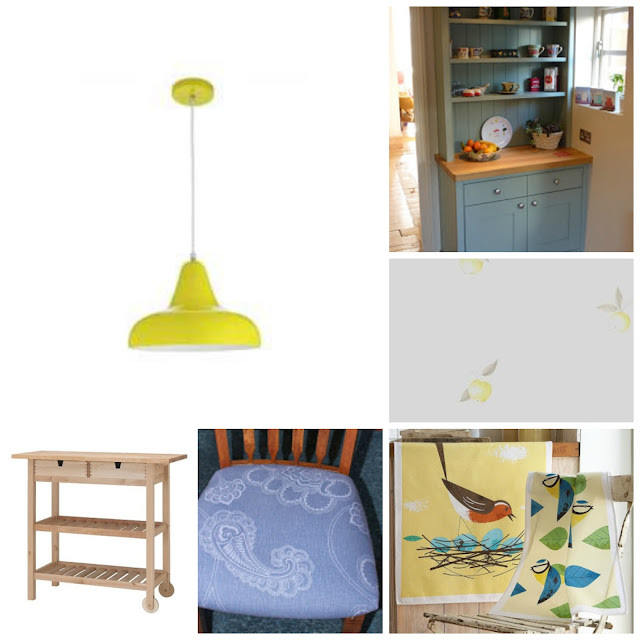 I have put together a little mood board of some of the items that will be in our dining room once finished. Yellow Light: It is in the Habitat range in Argos and has lots of coordinating pieces. We have had this sitting in a box on my fresser for about 5 months but have no reputable electrician to install it (along with an extractor hood and 2 other light fittings). My job on Monday morning is to find one to come and commence work immediately! It is quite big and I want it to be a feature but can't be too low otherwise the children will literally, not figuratively, lit-er-ally swing on it! Grey Dresser: This is a similar design to mine only mine is currently pine coloured. It is not pine though but simply has a veneer which is coming off so I am going to paint it grey. I will be ordering the Annie Sloan Chalk paint rather than using the one I did the other little shelves with as that had a satin finish. Since I haven't ordered it yet and nowhere in Malvern stock it, I will not et this finished for a few weeks sadly. Wallpaper: This however, I aim to put up on Monday- eek! I have never done it before so I will be watching many a youtube tutorial on Sunday night. I have the papering table, brush, paste and of course the paper all ready to go. My father in law will not be too far away if I go wrong though and it is only one wall so 2 rolls ought to cover any mistakes! Chairs: These are the dining chairs that I covered last year which will take main stage clearly since it is a dining room. I also used this material to make the curtains which I will showcase when it is all finished. Recovered chairs and handmade curtains, not to mention that I and a female friend did the curtain pole too is quite the crafting accomplishment methinks. Ikea Trolley/ island: We bought a very similar one to this off ebay nearly 2 years ago for £30 instead of £80 new. I will also be paiting the drawers and shelf edges in the Annie Sloan grey. Other items include the dining table and 5 other chairs, a large ornate black mirror (that I am VERY tempted to paint yellow!) and a few other wall art bits. I have bought lots of ochre items for the dresser but now need to balance it with more blue and grey to match the scheme. It's all very exciting for me as it really was a blank slate; here's the before picture so you have an idea of the space I'm working with. I'm looking forward to showing you the results and the crafty bits I make to individualise it and also the handmade pottery I have already bought form a local potter. Hopefully that will be sooner rather than later and there will also be a new garden to show you too.